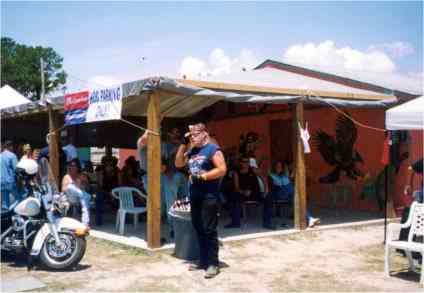 Below is one of the most laid back and biker friendly bar's that I've had the pleasure to visit in a long time. 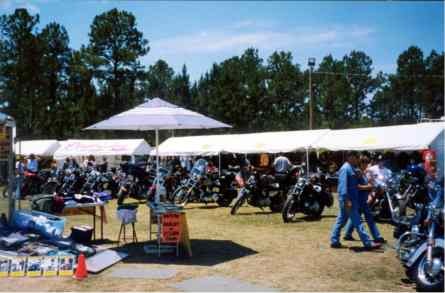 I started going to the Gulfport Mississippi Memorial Day all Harley Blowout in 1990, on one of the trip's I decided to find some place with an airconditioner to cool off from the heat of Mississippi in May. Well I got on my bike and figured I would ride into Gulfport or Biloxi to find this oasis. As I rode out of the blowout grounds for some reason I turned right which would take me back to the interstate. 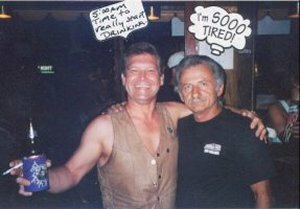 I hadn't gotten out of third gear when I noticed a little roadside bar called the "Crystal Rose". I had passed by this bar everytime I came to and left the Blowout. Well, I decided as hot as it was I didn't want to ride very far so I turned into the little nondescript bar and stumbled inside. I sat down at the bar and had a beer that had to be the coldest beer I've drank in a long time. 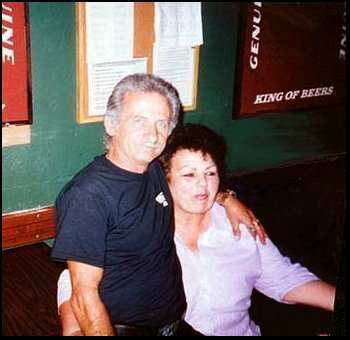 Well, a couple of years later I went to the Blowout with a friend and yes we went to the Crystal Rose, this time I was introduced to the owners Evelyn and Pappy who have become very good friends and the Crystal Rose has become a regular yearly stop. two of the nicest people I've ever met. 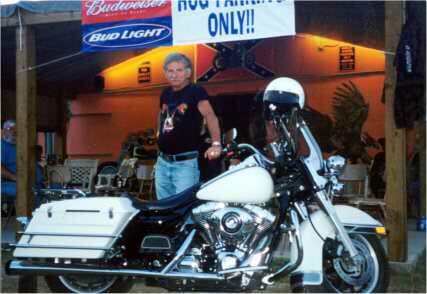 Pappy and his new RoadKing, aint she a beauty! Here is a photo of Evelyn hard at work selling those beautiful Crystal Rose T-shirts. The party at the Crystal Rose expanded alot this year as in evidence by the vendors present, and will probably get bigger each year. 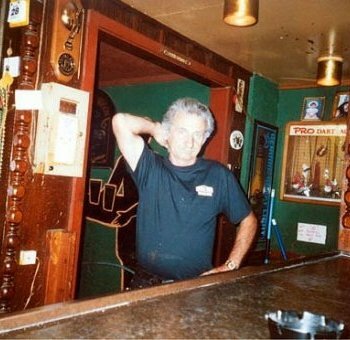 If you are ever in the general area of Canal Road in Gulfport Mississippi please do yourself a favor and stop in and have a cold beer with Pappy, and tell him RoadHog sent you. Better yet, make your plans now to be at the Blowout next year and make the Crystal Rose your oasis for some cold beer good friends and a great party.